By using AWS Lambda, we’ve cut our CRISPR off-target search times by 90% and scaled to hundreds of genomes. With faster searches, scientists using our platform can spend more time focusing on their research. Benchling is a San Francisco–based life science software company that provides a complete R&D software platform. The system makes it easy for scientists to design, organize, and share their experiments from start to finish, and it offers a suite of workflow management as well as molecular biology design and analysis tools to support its aims. Today, Benchling has thousands of customers, including biotech and pharmaceutical firms, as well as academic and government labs. CRISPR is a breakthrough technique that researchers use to modify parts of a genome with extreme precision. Because scientists worldwide use CRISPR to build disease models and screen for drug targets, Benchling needs to ensure its platform is fast. “We want to enable searches across hundreds of genomes as quickly as possible, so researchers can design better experiments with less effort,” says Vineet Gopal, an engineering manager at Benchling. Using the Benchling platform, scientists can quickly identify possible accidental matches to select the best candidate sequences for their CRISPR experiments. Benchling currently supports CRISPR workflows for more than 100 organisms and is continuously adding more. 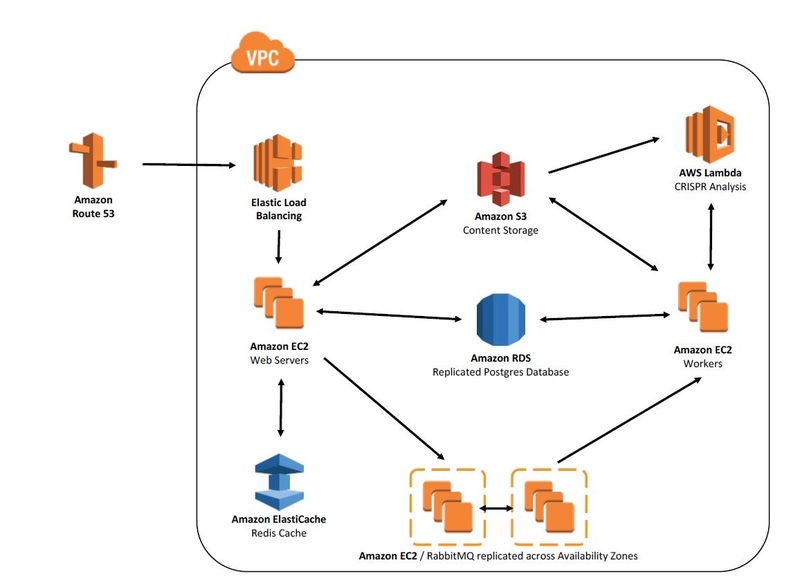 Benchling had already been using the Amazon Web Services (AWS) Cloud, taking advantage of Amazon Elastic Cloud Compute (Amazon EC2) and Amazon Simple Storage Service (Amazon S3) to support its platform. The company was also using a combination of AWS CloudFormation and an Amazon Virtual Private Cloud (Amazon VPC) to make it easy to spin up database clones for customers. To increase scalability while reducing costs, Benchling built their application using a serverless architecture by using AWS Lambda to run code without needing to provision and manage servers. The organization’s goal was to split up a CRISPR search across several AWS Lambda tasks to reduce costs and boost scalability. Learn more about genomics in the cloud on AWS, and how you can use AWS Lambda for running code without needing to provision and manage servers.